I’m busy this week preparing for a family reunion we host every year, so I’m rerunning a post that has gotten a lot of views because many search for the very popular parable I include. Perhaps you can relate to how I take the parable a bit further. A stand for truth is becoming increasingly rare in today’s relativistic society, where your truth doesn’t have to be my truth and everything can be true, which of course means nothing is. A seeking after truth is also more frequently being seen as an outdated and rejected discipline. And a refusal to acknowledge truth when it’s staring you in the face, willfully closing one’s eyes lest they see, has to be one of our generation’s greatest sins. There’s a well-known parable about six blind men and an elephant. 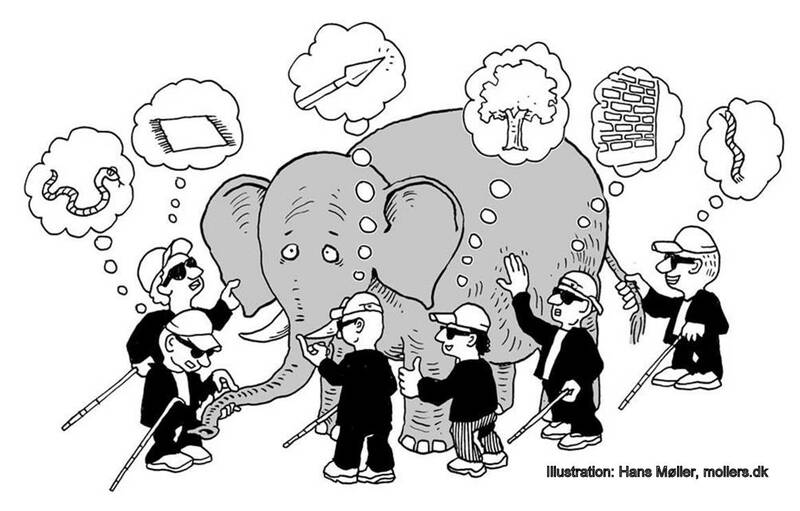 The parable is designed to demonstrate that truth is relative and no one religion has the truth, and it goes like this: Six blind men are standing next to an elephant and touching different parts of the elephant’s body. The one touching its tusk thinks, “This is a spear.” The one holding its trunk thinks it’s a snake. Another grabs an ear and believes he’s got a fan. A fourth blind man wraps his arms around a leg and thinks it’s a tree; another leans on the animal’s side and “sees” a wall; and the guy on the end grabs the tail and figures he’s holding a rope. So, the moral of the story is that multiple religions or worldviews can all have the truth; they just each see it from a different perspective. But here’s the problem with that conclusion: the truth is that each of the blind men was touching an elephant and they all got it wrong. None of them had the truth. I’d like to carry that parable a little further, because I see in each of the sincere but sincerely wrong beliefs a reason why people choose to be blind to the truth. The spear represents power. People and religions who get ahold of it do not want to let it go. It’s intoxicating, and they like it. The snake is pride. “You will be like God,” the serpent said to Adam and Eve in the garden. We want to believe that we are the masters of a universe which our superior intelligence will someday have all figured out, and our inherent goodness will make a utopian world for all mankind. I see the fan as representative of sensuality. It feels good and…you know the mantra…if it feels good, do it. And if it doesn’t feel good, I don’t want to know about it. The tree hugger . . . that’s idolatry, worshipping the creation rather than the Creator – anything that doesn’t hold us accountable or make any demands of us. The guy who thinks he’s leaning on a wall is lazy and apathetic. He’s happy just believing what feels comfortable. I see the rope as reins and the most common reason we refuse to see. We want to be in control of our own lives, turning left or right as we see fit. God has given us plenty of evidence of his existence in what he has made, in the record of his dealings with men, in our own consciences, and in the Person of his Son, Jesus Christ, who is the way, the truth, and the life. Those who reject that evidence will have no excuse when they stand before their Maker, contrary to Bertrand Russell’s oft-quoted rejoinder. So the moral of my take on the parable is this: an elephant is pretty big and hard to miss . . . unless you want to.